On 26-28 November 2012, ADEA, in collaboration with BMZ/GIZ and the Center for Phytotherapy Research and Development (CEPHYR) held a workshop on Education for Sustainable Development in Mauritius. The meeting brought together representatives of Ministries of Education, and Environment and universities/teacher training institutions from Benin, Burundi, Burkina Faso, Cameroon, Kenya, Mauritius, Lesotho, South Africa, Swaziland and Uganda, as well as officers from SADC, the Indian Ocean Commission and an Economic Community of Central African States (ECCAS) Youth network. 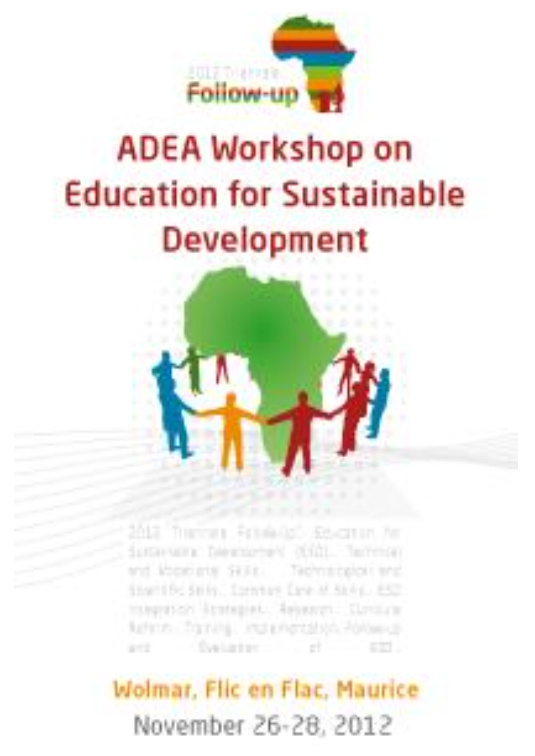 The rationale for organizing the workshop stemmed from the follow-up framework of the ADEA 2012 Triennale on Promoting critical knowledge, skills and qualifications for sustainable development in Africa: how to design and implement an effective response by education and training systems? The key objective was to bring together ministry officials, African experts and their international partners for experience sharing in order to reach a common understanding of the implications of the concept of Education for Sustainable Development for the education and training systems in Africa. It was expected that the workshop would culminate in inter-country collaboration regarding adoption of strategies and mechanisms to promote essential competencies that would enable the youth as well as the adults to make responsible and judicious use of available natural resources to ensure inter-generational equity as well as build a peaceful and prosperous future. Leading on from recommendations made at the ADEA Triennale 2012 that the concept of sustainable development “has since expanded to encompass the social and economic infrastructure that determines a society’s capacity to maintain itself in a rapidly changing global context”, participants renewed their understanding of education for sustainable development (ESD) in the light of shared knowledge and country experiences. The first day of the conference was devoted to a discussion on ESD and its cross-sectoral implications for action. This was followed by various actors and representatives showcasing activities in several sectors including on-site visits to a NGO multi-literacy programme and a government environmental action on coastal erosion/pollution. The third day included discussions on the relationships between education, sustainable development, research, technology and industry and the way forward. A number of outcomes were proposed as a draft work-plan for 2013. Primarily, it was agreed that ADEA needs to facilitate regular inter-country dialogue and partnership so as to ensure the strengthening of technical and institutional capacities of countries through a variety of strategies including enhancing the networking of institutions and individuals with ESD expertise and experience of innovative practices. It was assumed that this would make ESD the key entry point and driver for paradigm shifts in the way education and training serve Africa’s development.